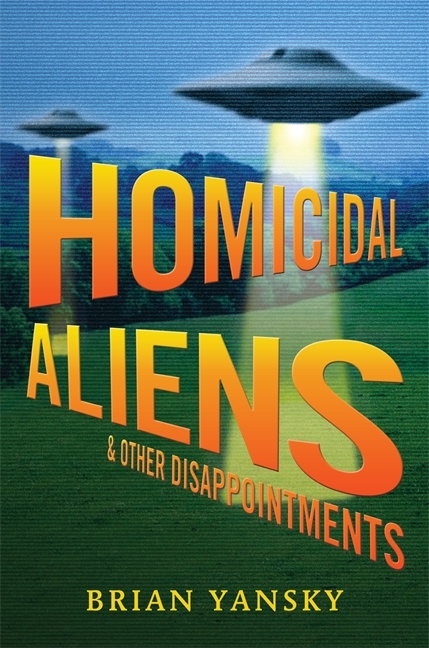 Homicidal Aliens and Other Disappointments (Candlewick, 2013) by Brian Yansky is the sequel to Alien Invasion and Other Inconveniences (Candlewick, 2010). It’s a YA, sci-fi novel set right after most of humanity has been destroyed by a race of machine hating, green plant loving, and ridiculously polite psychic aliens. Don’t be put off if you haven’t read the first book (though I’m guessing you’ll want to after you read Homicidal Aliens, so you might as well get them both). Brian Yansky does a great job of bringing new readers up to speed quickly and interestingly. And he does it without a big, clunky “previously on” opener. Homicidal Aliens does start with a four page prologue, but it only takes about a page and a half to mostly summarize the first book. After that, Yansky begins to introduce the reader to a cool new revelation about his fictional Earth. This nicely crafted prologue turns out to be a structural harbinger of things to come. Throughout the rest of the adventure the author elegantly weaves relevant highlights from Alien Invasion into Homicidal Aliens like nothing more than well executed back story. And then there’s the voice. Yansky’s hero and narrator, Jesse, has a dry, endearing wit that’s immediately engaging. I got hooked on his no frills, authentic voice at the start of the first book. So I was thrilled to find the second one carries on in the same gloriously unadorned way. Too often YA writers sound like adults talking “about” teens. Not Yansky. Jesse’s got lots of interesting and relatable personal dilemmas, with a rich internal life that really grounds the book’s first person narration. One of his most endearing traits is his way of swearing. Out of deference to his mom ­– killed like most of the rest of humanity in the initial alien invasion – Jesse substitutes literal translations of well-known profanity. Things like “son of a female dog.” I won’t spoil the fun, but suffice it to say, he gets much more creative with some of the other bad words you may know. Something else I dig about this book is the way Yansky drops in little one-line snippets of social commentary. He deftly critiques huge social issues like racism, imperialism, and climate change with a refreshingly light touch. Don’t worry, this is not a preachy book. But it is a thoughtful one. Yansky’s creation works on lots of levels. Though none of Jesse’s passing comments and thoughts on human society change the fact that Homicidal Aliens is first and foremost a tightly paced sci-fi adventure. It makes a great stocking stuffer for any teen who’s into aliens, dystopias, or adventure stories. And it’s especially ideal for any young male readers out there craving a quality story that doesn’t have a female protagonist. Actually, it makes an excellent present for anybody who just likes a well-crafted sci-fi novel.